I like hats. I only wish I had a smaller head! You see they always seem too large for me, so I have to steam them or add a band inside so they fit. Why just on Wednesday I saw a remarkable hat in a vintage shop and was really tempted to buy it, but it came down round my ears plus I would have to have made an appropriate outfit to match it. This is Friday and I'm still craving the hat! As an older teenager I had two hats to match coats. One was a smart gray trilby to match a double breasted military style gray coat. The other was a cream felt fedora style creation to match a heavy wool coat in dark brown which was one of my final outfit tailor makes for college. How I wish I'd kept all those garments...but mind you they wouldn't have fitted any longer! Then in the late 60's I made caps... sort of jaunty and folkish to match trouser suits. Also winter snoods that covered the entire head and neck, very suitable for Aberdeen winters. 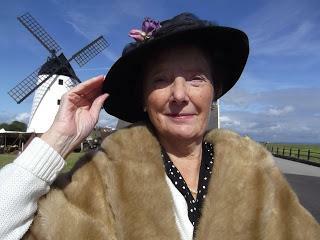 I bought fur coats at jumble sales and trimmed garments, made muffs and always a stylish hat. Now I satisfy my liking for hats by wearing a variety of styles taking me back to the 40's and 50's. So it is that I look in charity shops for likely contenders. I have a couple of winter hats , furry, warm and over the ears, but they are difficult to keep on in high winds (as are the vintage hats). Speaking of the latter I try hat pins, inner hair bands and various other ploys to try and keep them on...usually it's my hand that does the best job! whilst I drank and ate . I chose one with a zip down the front so that I didn't have to remove the hat and get cold! It's rather sad the demise of hat wearing, but then our modern modes of dress and transport, and general casualness have seen to that. My poem today was written on Wednesday evening when the hat I had seen was still on my mind. Don your titfer , missus We're going for a walk. Link you arm through mine And together we shall talk About the years that fled so fast, The children grown and gone. One daughter with her own young And our eldest and only son. Toss your head and show the world Your best hat bedecked in flowers, The ribbons entwined around the brim Took painstaking sewing hours. When we wed you wore that hat. (It's seen many others too). You've changed its look many times, But it's seen these many years through. It's faded now, your best hat- Well past its best by now- Still you wear it well- (I'm not too sure just how). It's survived the children's dressing up, The weekly trek to town, Sometimes a trip to Blackpool, Matched nicely to a gown. Don your titfer, missus We're going for a walk, Link your arm through mine And together we shall talk About the years we've spent together In sunshine and in strife, Our troubles and our blessings- Put your best hat on, dearest wife.